Photography is indeed the most popular form of art nowadays and people are open-heartedly appreciating it a lot. Almost everyone owns a smartphone with an excellent in-built camera feature. However, not only as an entertainment source, but there are people who take photography seriously and make it their career. There are professional photographers that take normal photography to next level through their photography websites online. A clean photography website adds that extra charm on your photographs and makes them more appealing and easy-on-the-eye. And for that, you need simple yet feature-rich photography WordPress themes. So, understanding the importance of photography WordPress themes for creative personalities, our Catch Themes team has really been emphasizing on providing clean, simple yet striking photography themes. We’re implementing features that would surely uplift your photography website and make it stand out among others. Photography WordPress themes are popular for their unique designs. These themes specialize in reflecting the owner’s artistic nature and helping them showcase their best work in the best manner possible. Photography WordPress themes combine stunning layouts with different image formats and dimensions that help in making any photography website beautiful, sleek and professional. For creative like photographers, creative designers, and artists, it is very important that their photography websites roar out loud and attract more visitors. And in order to do that, you need to choose your themes very wisely. You need to check on all the essential photography features to flaunt your camerawork to the world. We are currently focusing on providing clean, simple and feature-rich photography WordPress themes for creative personas. Our photography themes are visually vast and stunning, feature-rich and functionality versatile, deeply creative and very easily customizable. All of our photography themes are specially designed to devise and develop awesome photography websites in a matter of minutes, without having to write a single line of code. In our photography WordPress themes, we include features that are essential to creating not only striking photography websites, but also other inventive websites like blogs, portfolios, and more. Furthermore, we’re looking forward to crafting more photography WordPress themes for our valued customers. We tend to make our photography themes full responsive, visually appealing and add an abundance of creative features in it. We provide our themes in both premium and free version. Check out our collection of top 10 free and premium photography WordPress themes. Our premium photography WordPress themes provide you with all the innovative features to craft strikingly bold and beautiful photography websites. With our premium photography themes, you will be provided with an array of advanced features that are not available in the free ones. Our photography themes are perfectly designed for creating photography websites for photographers, graphic designers, freelancers, artists, or bloggers. We believe in providing our visitors with the best features to showcase their photography work in an aesthetic fashion. So, here’s a list of the top 10 premium photography WordPress themes that have been crafted by our experienced developers and designers in Catch Themes. Corporate Fotografie Pro is a premium Blog and Corporate WordPress theme. It is ideal for those who’re trying to promote their photography business online. It is a child theme of our popular photography WordPress theme – Fotografie Pro. However, Corporate Fotografie Pro focuses more on blog and corporate businesses. Crafted beautifully for Corporates and Blogs, it is a clean, minimal and responsive WordPress theme that looks aesthetically beautiful across all devices. It comes with an array of features that are crucial for business websites, such as Header Media, Sticky Menu, Portfolio, Hero Content, Featured Content, Featured Slider, Font Family Options, WooCommerce Integration, and more. It lets you highlight your special contents, categorize them neatly and showcase your major abilities through your website. 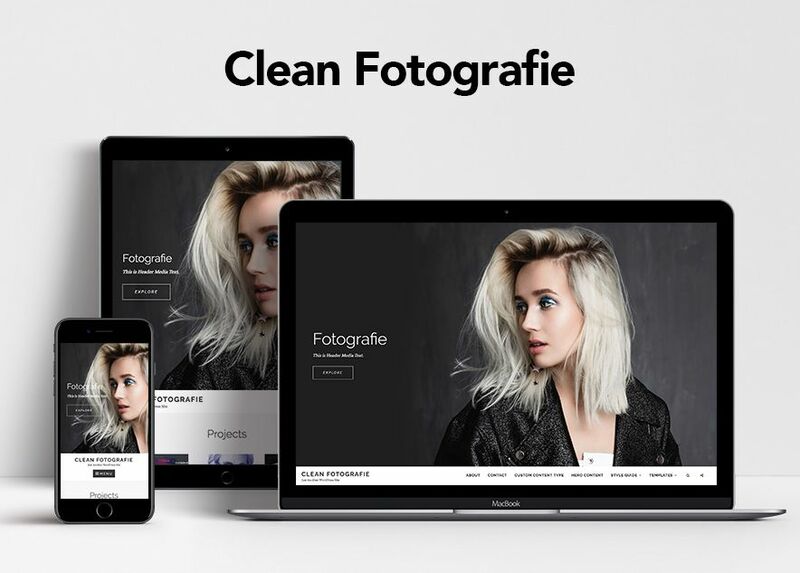 Clean Fotografie Pro is a simple, clean and feature-rich premium photography WordPress theme designed to showcase your photography to the world at large. It comes with high-quality features and minimal design to fit perfectly for photography websites. It is a child theme of Fotografie Pro. The theme is simple, clean, elegant and aesthetic. It is ideal for creative people, such as, artists, graphic designers, illustrators, photographers, bloggers, and creative agencies who desire to showcase their high-quality work with minimal interference. This theme is visually enthralling and stunning, professionally designed and composed, stylistically flexible and very creatively inspired. Clean Fotografie Pro comes with amazing features—like header media options, hero content, color options, menu options, and more—that are crucial to take your photoblog website to next level. 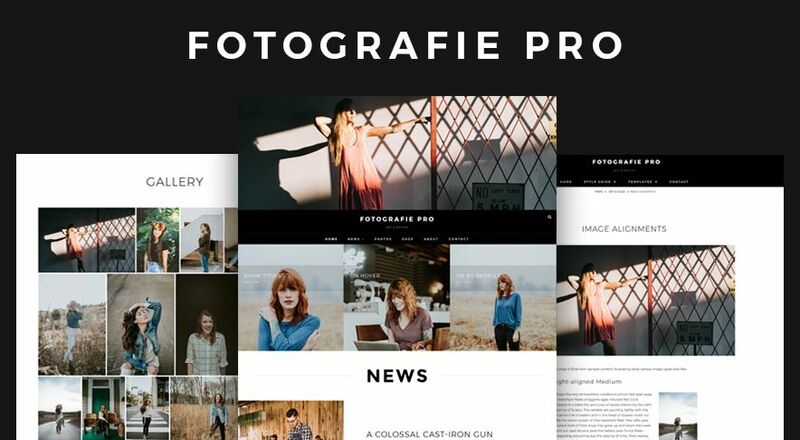 Fotografie Pro is our most popular Premium Photography WordPress theme. It is a modern photography WordPress theme that comes with high-quality features and minimal design. True to the essence of the German word, Fotografie is simple, elegant and straightforward. It is ideal for creating photography websites for photographers, graphic designers, freelancers, artists, or bloggers. It comes with basic features that are extremely crucial, like header media options, hero content, portfolio, featured slider, featured content, color options and menu options, footer editors, layout options, font family options, WooCommerce Options, Content Options to create a simple and elegant website in no time. Designed to make your photographs stand out with clear, easy to read content, Fotografie Pro has it all to take your photoblogs to the next level. Fotografie Pro stands out in the respect that it puts your photographs in the limelight while doing all the important background work. Showcase to the world what’s important – your photography! Adonis Pro is simple, clean and super user-friendly Personal WordPress theme for professionals. It is ideal for creative personas to showcase their photographs and portfolios in the forefront. The theme has been crafted in a way, through which, the world will effortlessly know about you and your work. Adonis Pro comes with an array of amazing features — such as, site identity, header media, header image, background image, custom menu, breadcrumb, excerpt, featured content, featured slider, logo slider, hero content, layout options, pagination options, portfolio, testimonials, services, testimonials, contact info, stats, color options, family options, and many more — that are extremely crucial for any professional to flaunt their work. So, keep your blog varied, entertaining, and let the world know about you with Adonis Pro! Catch Fullscreen Pro is a premium one page WordPress theme with a captivating design that fits perfectly for photography websites. It comes with crucial features such as gradient background color options, font family option, sections sorter, hero content, gallery, menu options, portfolio, promotional headline, service, team, testimonials, WPML ready, WooCommerce ready, and more. All of these are extremely crucial to create a strong and beautiful photography website. 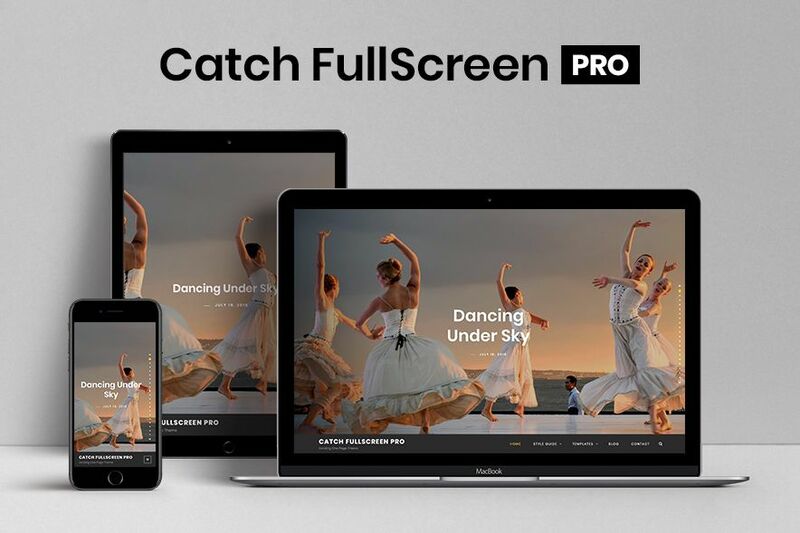 Catch Fullscreen Pro is completely responsive and your website will look perfect on all devices. If you prefer the simplicity of a one-page site, Catch Fullscreen Pro is the best option to go for. This theme is a great pick for designers, photographers, or illustrators who prefer simple and easy website than the ones that are complicated and multi-paged. 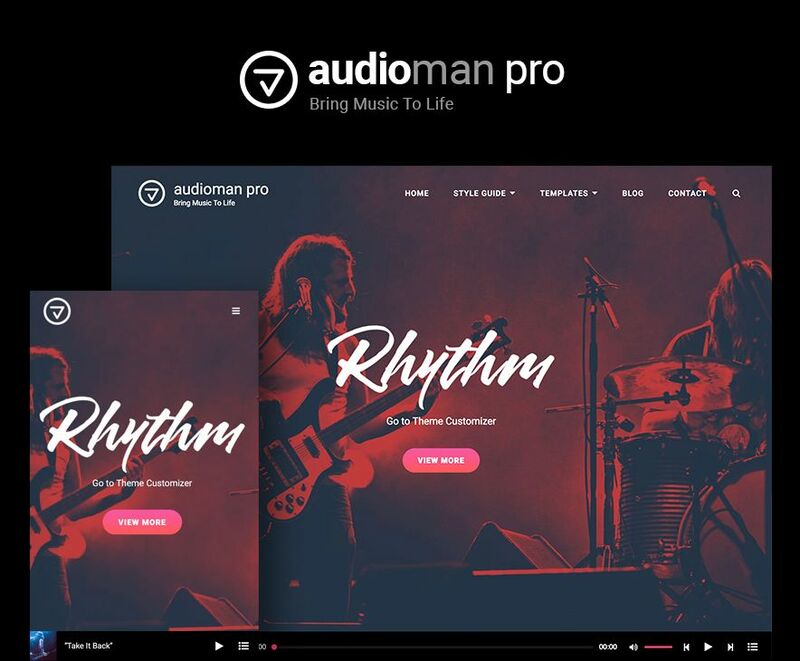 Audioman Pro is a well-designed, modern and trendy Premium Music WordPress Theme built for musicians and bands. However, the amazing features in Audioman Pro allow you to create an outstanding photography website as well. Its homepage is dominated by your music logo, tagline, and an amazing header media option where you can choose an image or a video for your header. With features like events, featured video, font family options, gallery, header top playlist, hero content, playlist, portfolio, section sorter, team, testimonials, WPML ready, WooCommerce integration, and more give you plenty of customizing power. You can craft an outstanding WooCommerce marketplace to sell your merchandise and provide a multi-language experience for your users. Personal Trainer Pro is a powerful and impressive, reliable and robust, user-friendly and highly responsive multipurpose fitness WordPress theme. Personal Trainer Pro is a capable framework for crafting impressive modern websites of any kind, including photography websites. With this theme, you can build awesome fitness center websites in just a matter of minutes. Personal Trainer Pro provides you with incredible features—such as, custom header image, featured slider, featured content, portfolio, contact info on the header, services, professionals, reservation, testimonials, ecommerce, and more—that are extremely crucial to make your website of any kind, a hit among others. Personal Trainer Pro’s clean design and power-packed features will definitely ensure your reach is broader than you ever thought. Parallax Frame Pro is a premium WordPress theme that specializes in corporate and business websites of any kind, including photography business. Parallax Frame Pro uses Parallax scrolling effects to enhance the user experience and increase your clientele. Parallax visual effects will make your photography come alive. Simple, clean and fully responsive; the HTML5 and CSS3 codes used in building the theme make it a breeze to work with. It helps you create a website as unique as yourself, making you stand out from the rest of the crowd. This theme is a powerful set of tools for devising and developing awesome websites in a matter of minutes, without having to write a single line of code yourself. 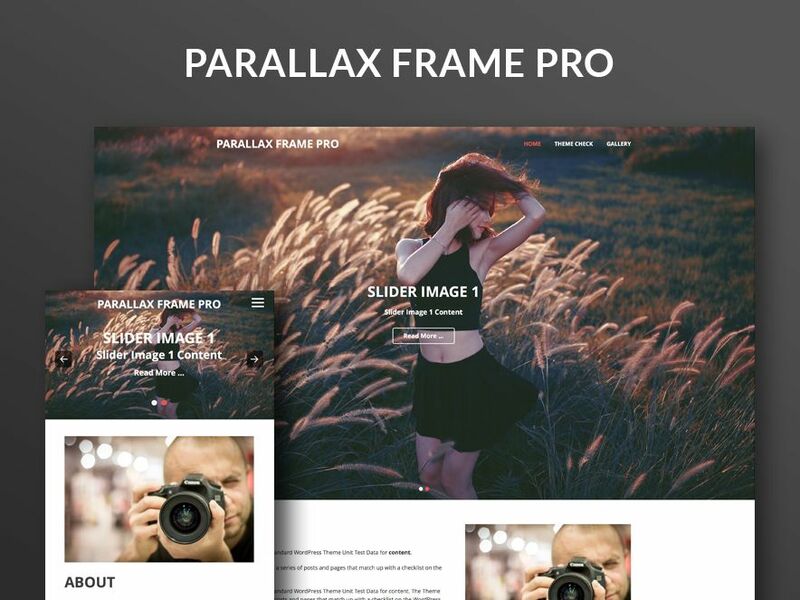 Check out Parallax Frame Pro today! 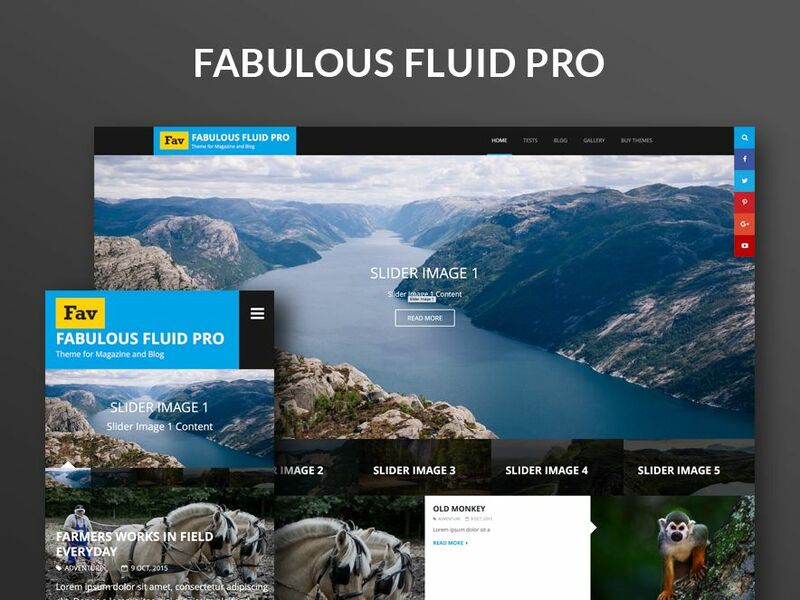 Fabulous Fluid Pro is a beautifully crafted Premium WordPress theme for Photographers, Bloggers, Personal and Magazine Websites with flexible and customizable theme customizer options. Its responsive design perfectly displays on all devices and platforms where each element has been carefully configured. It is based on HTML5, CSS3 and WordPress Theme Customizer for real-time customization. It comes with an array of useful options so you can modify layout, styling, colors, fonts, featured content, featured slider, featured grid, promotion headline, pagination, icons, menus, breadcrumb, widgets and much more directly from theme customizer. 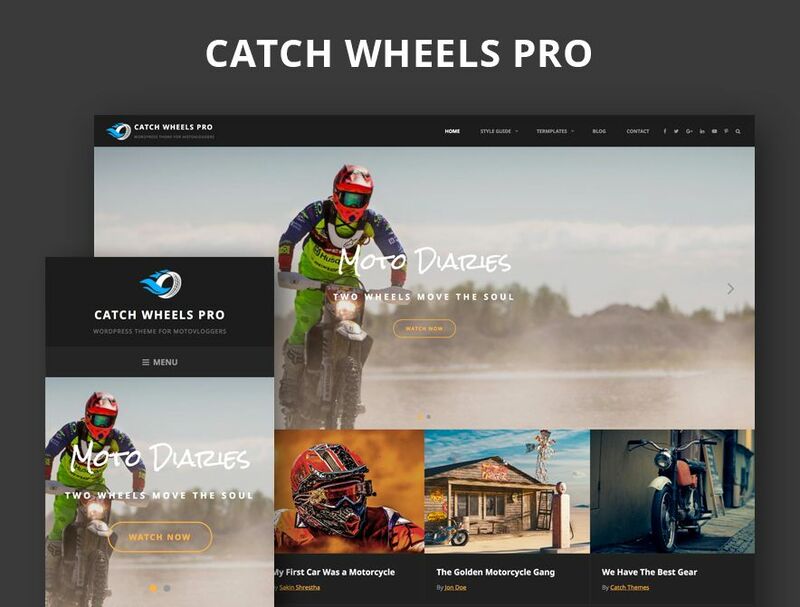 Catch Wheels Pro is a unique and powerful, reliable and robust, creative and elegant, smooth and bold WordPress theme for Motovloggers and Vloggers. The theme has been specially designed keeping the creative Motovloggers in mind. You can also create beautiful photography websites in only a matter of minutes. It is completely responsive and your custom website will look stunning on all devices. It comes with basic features that are extremely crucial to create a bold and adventurous website for Motovloggers, like portfolio, events, color options, hero content, font family options, menu options, promotional headline, services, layout options, and more. With all these amazing features integrated into the theme, Catch Wheels Pro will surely help you create a strong, adventurous and bold website with the feel of professionalism in no time. Catch Wheels Pro—a perfect choice for Motovloggers with a passion to ride! Our team is very passionate about crafting free WordPress themes as well. It is also a great way to give back to our lovely WordPress community. We have crafted several free photography WordPress themes so that users can first get the taste of the premium version of our themes. When it comes to photography WordPress themes, we tend to provide amazing features in our free themes as well. Check out our collection of amazing photography WordPress themes that you can get without hurting your wallet. Corporate Fotografie is a Free WordPress theme that promotes your photography business online. It is a child theme of our popular Photography WordPress Theme “Fotografie”. 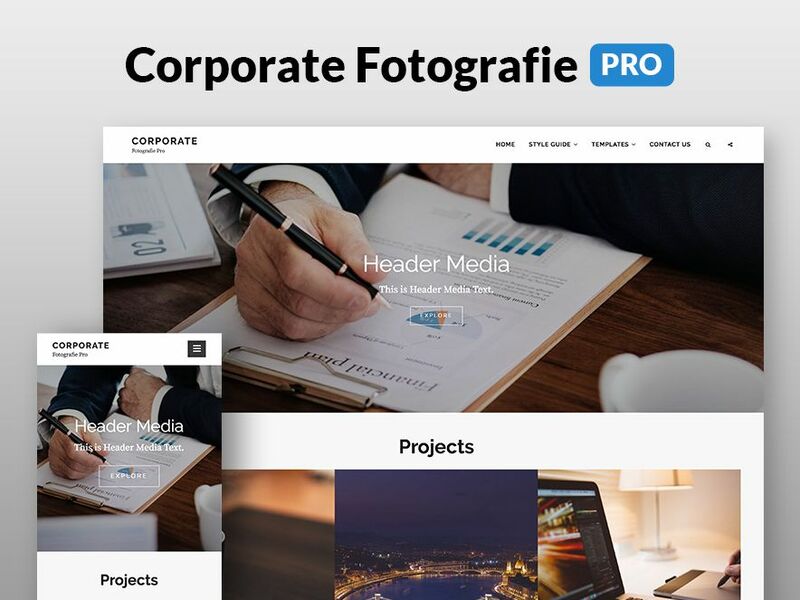 Corporate Fotografie comes with an array of key features for your business website — such as Header Media, Sticky Menu, Hero Content, and more — to stand out among others. Corporate Fotografie sure is dedicated as a theme for Blog and Corporates, but it isn’t limited; it can work well for any range of websites. Since it is a child theme of a photography WordPress theme, it inherits features that fit for a photography website. Also, with WooCommerce integration, you can create an awesome online shopping portal in no time. Check out Fotografie Pro if you want more features and functionalities to make your creative photography website supreme and rip-roaring. Clean Fotografie is a feature-rich, simple and clean Photography WordPress Theme. It has been specially designed for creative personas to showcase their creative and professional photography to the world at large. It is a child theme of our photography WordPress theme, Fotografie. Clean Fotografie is simple, clean, elegant and feature-rich. It is ideal for creative people, such as, Artists, Graphic Designers, Illustrators, Photographers, Bloggers, and other Creative Agencies who desire to showcase their high-quality work with minimal interference. Clean Fotografie comes with amazing features—like header media options, hero content, color options, menu options, and more—that are crucial to take your photoblog website to next level. The theme is extremely responsive and functions beautifully across all devices. If you want advanced features to make your photography stand out among others, check out the premium version of this theme – Fotografie Pro. Fotografie is a popular free Photography WordPress Theme in WordPress.org theme repository. Fotografie is a modern photography WordPress theme that comes with high-quality features and minimal design. It is ideal for creating photography websites for photographers, graphic designers, freelancers, artists, or bloggers. It comes with basic features that are extremely crucial, like header media options, hero content, portfolio, featured content, color options and menu options to create a simple and elegant website in no time. Designed to make your photographs stand out with clear, easy to read content, Fotografie has it all to take your photoblogs to the next level. Fotografie stands out in the respect that it puts your photographs in the limelight while doing all the important background work. Showcase to the world what’s important – your Fotografie! Go for Fotografie Pro if you want advanced photography features. 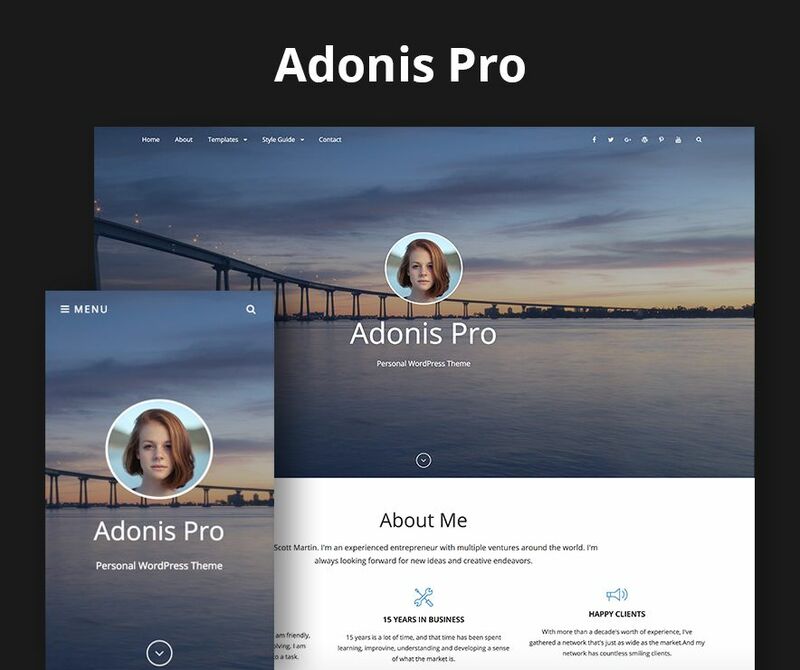 Adonis is a free Personal WordPress theme for professionals in any field. It is simple, clean and user-friendly. It always put everything you have to offer in the forefront. Adonis theme has been specially crafted for the professionals to let the world know about them at large. With features implemented in this theme, you can create a simple and beautiful photography website in just a few clicks. It mainly focuses on creating an elegant personal website for the professionals in only a matter of times. It is based on responsive design, allowing your website to look beautiful on any device, regardless of the screen size. 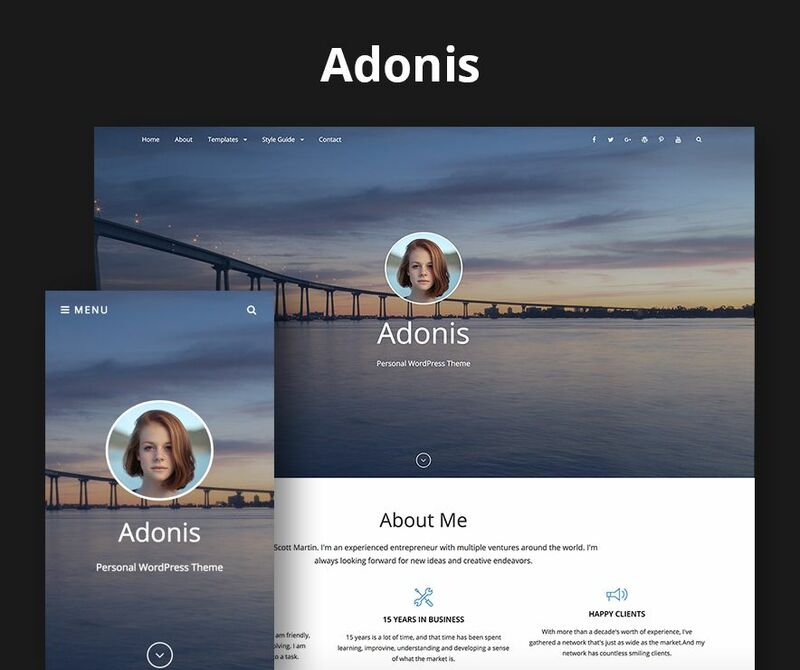 Adonis comes with a plethora of awesome features – such as site identity, header media, breadcrumb, featured content, hero content, layout options, portfolio, testimonials, and more. Adonis Pro, the premium version carries advanced features, so don’t forget to check that out as well. Catch Fullscreen is a free one page WordPress theme that comes with incredible features and captivating design that fits perfectly for creative websites like photography. The theme is extremely easy to customize and you will not have to deal with the most troublesome coding task. Catch Fullscreen provides you with crucial features such as header media, featured content, featured slider, hero content, layout options, portfolio, testimonials, and more. The theme is completely responsive and your website will look perfect on all devices. It also helps you build a single scrolling page with great attention to typography and is eye-appealing. For more features, do check out Catch Fullscreen Pro WordPress Theme. 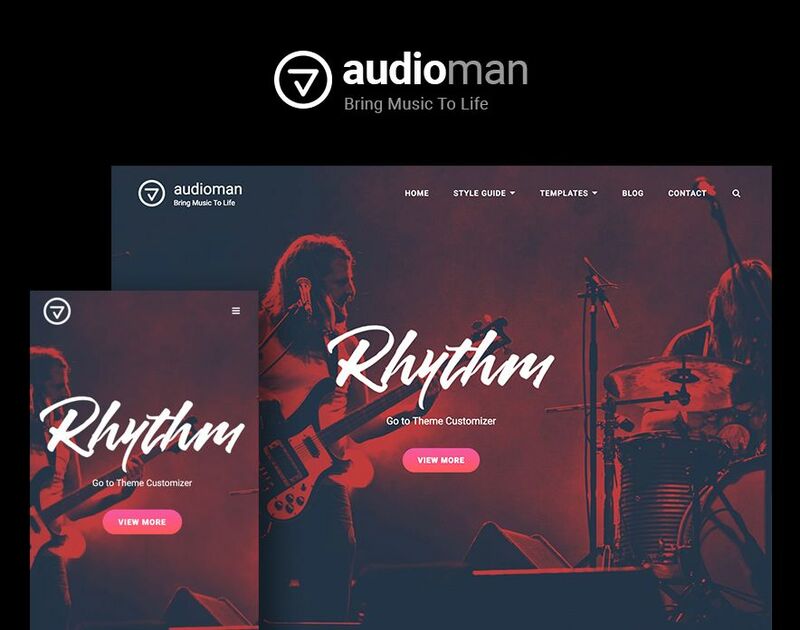 Audioman is a well-designed, modern and trendy free Music WordPress Theme built for musicians and bands. This theme is ideal for creating a stunning photography website as well. It comes with an array of features — such as header media, featured slider, featured content, hero content, playlist, portfolio, testimonials, and more — to keep your music website on the forefront. Audioman is completely responsive, which means your website will look incredibly sleek and visually appealing on all the devices with different screen resolution. Furthermore, the theme is deeply engaging. The features in it will assist you in gaining genuine followers in a short period of time. For more advanced features like header top playlist, events, sections sorter, team, and more, check out the premium version – Audioman Pro. Personal Trainer is a Free Multipurpose Fitness WordPress theme is highly customizable and fits perfectly for gym, fitness center, personal trainer, and all other similar business. It is also ideal for crafting creative websites such as photography, portfolio and more. Personal Trainer is an amazingly beautiful, cleverly designed, extremely flexible, and greatly responsive fitness WordPress theme. Personal Trainer provides you with incredible features—such as, custom header image, featured slider, featured content, contact info on the header, services, professionals, reservation, testimonials, and more – that are extremely crucial to make your website of any kind, a hit, among others. For more powerful features, head over to the premium version, Personal Trainer Pro. Parallax Frame is a WordPress theme that specializes in corporate and business websites of any kind, including the photography business. This theme uses Parallax scrolling effects to enhance the user experience and increase your clientele. The parallax visual effects will make your photography come alive. Simple, clean and fully responsive; the HTML5 and CSS3 codes used in building the theme make it a breeze to work with. It helps you create a website as unique as yourself, making you stand out from the rest of the crowd. For more features, check out Parallax Frame Pro! 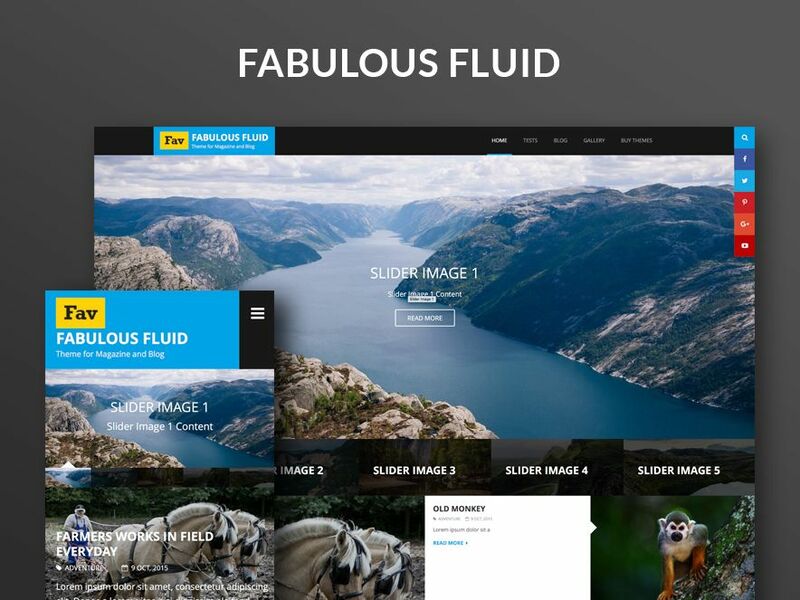 Fabulous Fluid is a beautifully crafted free WordPress theme for Photographers, Bloggers, Personal and Magazine Websites with flexible and customizable theme customizer options. Its responsive design perfectly displays on all devices and platforms where each element has been carefully configured. It comes with an array of useful options so you can modify layout, site identity, colors, promotion headline, pagination, menus, breadcrumb, widgets and much more directly from theme customizer. Other basic features like responsiveness and retina ready graphics are also there. If you want more features, dive into the premium version, Fabulous Fluid Pro. Catch Wheels is a unique and powerful, reliable and robust, creative and elegant, smooth and bold WordPress theme for Motovloggers and Vloggers. The theme has been specially designed keeping the creative Motovloggers in mind. However, you can also craft a striking and beautiful photography website with Catch Wheels. Catch Wheels is completely responsive and your website will look stunning on all devices. It comes with basic features like portfolio, services, layout options, and more that are extremely crucial to create a bold and beautiful website. With all these amazing features integrated into the theme, Catch Wheels will surely help you create a strong, adventurous and bold website with the feel of professionalism in no time. For advanced features, check out Catch Wheels Pro. 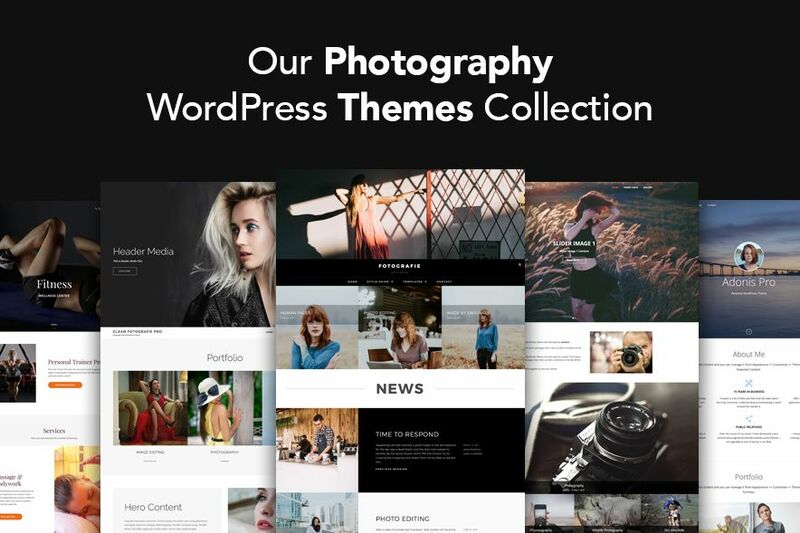 Finally, that was the collection of top 10 free and premium photography WordPress themes crafted by our Catch Themes team. All of these themes are perfect for photography and other creative websites. Choose the one that fits best for your website. Our premium photography WordPress themes provide a wide range of advanced creative features. Whereas, our free photography WordPress themes are more towards providing simple and basic features. Furthermore, the features integrated into our premium photography WordPress themes are perfect for crafting creative websites of any kind. Likewise, the features integrated into our free music themes make your website clean, simple yet power-packed. Which photography theme did you find the most appealing from the list? Are there any other features that you wish to see in our photography WordPress themes? Make sure you mention them in the comments. We will surely add them in our future releases. Thank you for stopping by and reading this article! We highly appreciate it! Thank you for providing such an nice information. Nice work Keep it up.